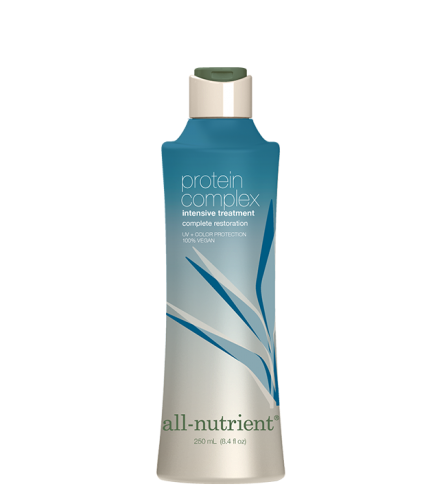 Protein Complex is an intensive treatment that repairs damage to over-stressed, porous hair. Active Keratin Proteins rebuild the polypeptide chains deep within the cortex to restore internal strength and protect the hair, leaving it healthy and rejuvenated. Rich in essential fatty acids, Rainforest Cupuaçu Fruit imparts lubricity and shine to dull, brittle areas. Hydroxyproline and Tyrosine work together to infuse moisture into the hair for complete restoration. After shampoo, apply to damp hair. Distribute evenly throughout with a wide tooth comb. Leave in the hair for 5-10 minutes, and then rinse. Use with our Pure Oil for a deep, conditioning treatment.